BODY BEAST Trainer, Sagi Kalev quotes a man by the name of Francois de La Rochefoucauld (dont ask me how to pronounce that) in the first section of the BODY BEAST nutrition plan. The quotes says, “To eat is a necessity, but to eat intelligently is an art.” This statement should be ringing all kinds of familiar bells in your head right now. 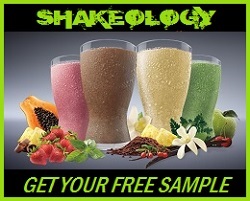 You have heard me say over and over again that, “Nutrition is 80% of your results!“. This remains just as true with BODY BEAST as it does with P90X, Insanity, or any other fitness regimen. The primary goal with this program is to gain muscle mass. Simple as that. Get big, get strong, get powerful. To do that, you need to understand the foundational principles of how that works. Nutrition is the primary focus to reach this goal. In order to gain muscle, you are going to need to eat. A lot! Making sure that you meet your daily caloric intake and nutritional macros is going to either make or break your results. The BODY BEAST nutrition plan will be the foundation of your results! Similar to many weight loss nutrition plans, the BODY BEAST nutrition plan will consist of 5 to 6 meals per day – maybe even more as you progress through each nutritional phase and require more calories. Each of your meals will consist of a balance of macronutrients. 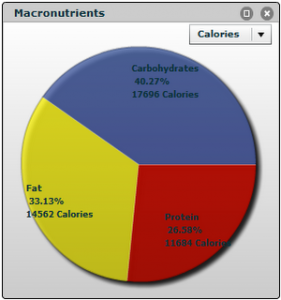 Macronutrients are made up of your proteins, carbohydrates, and fats. You need that balance of these in order to build muscle and shed fat. Protein is going to be your primary nutrient for gaining mass, because this is the only nutrient that can be converted into muscle in your body. Protein is made up of amino acids. When ingested, your body breaks down these proteins into those amino acids and reassembles them into proteins that your own body can use in order to build muscle tissue. Carbohydrates are your fuel! This is where your energy comes from and they are essential for recovery and intensity. You might be accustomed to avoiding carbs, but with the BODY BEAST nutrition plan, you are going to be using them to your advantage to make huge gains. The trouble with being used to eating low carbs on a mass gaining program is that your body will rely on other sources for energy if those carbohydrates are not available. Your body’s first response for energy when lacking carbs will be to start breaking down muscle tissue…not good! Fats are another primary source for energy when gaining mass. Foods with healthy fats will help to fight inflammation, joint pain, and muscle soreness. If you can battle those, then you have quicker recovery times – and that leads to more intensity in your next workout for bigger gains! Another important fat source in the nutrition plan is omega-3’s (found in fish, seeds, and other plant sources). These actually promote growth and hormone production! The BODY BEAST Nutrition Plan, just like the P90X Nutrition Plan is broken into 3 Phases: BUILD, BULK, and BEAST. The BUILD Phase of the nutrition plan is going to be your learning phase. This phase is going to elevate your current levels of intake from what you are currently at and its going to condition your body and habits to prepare you for the next phase. The focus on new habits is important! Remember when you did P90X and had to get used to eating 6 meals per day, tracking your nutrition. With any new nutrition program, there needs to be a conditioning period. The BUILD phase is going to help you get accustomed to proper cooking, higher food intake and even food carrying (you gotta be prepared, even on the go). Now its time to actually pack on the mass! 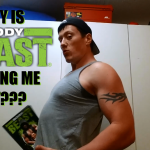 You got accustomed to all the new habits of eating to gain mass and now you get down to the nitty gritty stuff in Phase 2 of the BODY BEAST eating plan. Your macronutrients are going to stay the same, but something that might be completely new to you is recalculating the amount of calories you need based on the current condition of your body (weight and body fat %). As you continue into Phase 2, you want to keep in mind that quality of the foods you are eating is of the highest importance…Right up there with meeting your caloric and macronutrient goals. In both Phase 1 and 2, your macronutrients are broken down into 25% protein, 50% carbohydrates, and 25% fats. The natural thing for many is to raise an eyebrow at the increase in carbs from what you might be used to. You need not be concerned though because with the BODY BEAST nutrition plan, you are going to be eating a ton! So you are going to be taking in an abundance of all three macronutrients – so in no way are you going to be deficient in protein or fats. The level of carbs in this phase is important though! When gaining mass you want to avoid the body resorting to using muscle tissue for energy at all costs. That would be counterproductive to your goals! So when there are a lack of carbs…I’ll say this more clearly: Your body will break down its own muscle tissue and convert it to blood sugar for energy…you need the carbohydrates. Another concern is the 25% protein. Protein is the building block of muscle gains right??? So why so low? You dont need massive amounts of protein in order to build muscle. The body can only use so much protein at a time in order to build and repair muscle tissue. Anything in excess of what it needs will be used for energy or stored as body fat. The amount of protein someone looking to gain mass is about 1g of protein per pound of body weight. This plan will put you at the right amount with a little extra to boot. The 25% fat is going to help stablize your blood sugar levels and allows for carbs to digest more slowly. And like I stated before, fats also act as a fuel and are essential for recovery. Now its time to get into “show-quality” shape! You have bulked up, put on the mass and now its time to cut up and get ripped! Once again you are going to recalculate your body fat and your daily caloric intake need. Unlike the transition from Phase 1 to 2, from Phase 2 to 3 you will be adjusting your macronutrients. In addition, the timing of which you intake these macronutrients changes as well. Nutrient timing is going to be key to your success. What you do pre-workout, post-workout, and through out the day all matter! Check out my BODY BEAST Supplements post for more info on what I recommend in the way of pre/post workout supplementation. I will be using Beachbody’s Extreme Nutrition Supplements as directed in the BODY BEST Nutrition plan to maximize my results, but there are always alternatives. Its my objective to use what Beachbody has provided in order to test out the efficiency of their supplements so that I can recommend or advise against the use of these supplements. When you adjust your macronutrients for 40% protein, 30% carbohydrates, and 30% fats in Phase 3, along with a significant decrease in calorie intake, the primary goal here is to shed body fat! The reduction in carbs along with the reduced calorie intake will help to promote increased metabolism with a primary focus on using the increased protein and fat as fuel. The calorie deficit you will be running isnt so low that you will lose your gains, but because there are still some carbs in the nutrition plan, the breaking down of muscle tissue as an energy source will be minimized – but it will happen to some extent. The BODY BEAST Nutriton guide recommend that you limit Phase 3 to 4 weeks in order to prevent performance loss and the break down of muscle tissue. Unlike the P90X Portion Plan, I actually favor the BODY BEAST Portion Plan. Below I have provided a few linkS to some printable PDF documents, including: The BODY BEAST Portion Charts and the BODY BEAST Food Lists. I personally have more success with keeping track of my nutrition with myfitnesspal.com to focus on my macronutrient targets, but the BODY BEAST Portion Plan is clear and precise! In conclusion I am going to share with you a quote from Sagi himself about your nutrition with BODY BEAST. When it comes right down to it gang, even though you are eating more than ever, the lifestyle we choose still needs to be focused on health. Dont get caught up with some dude on youtube who told you that you dont need to worry about what you eat. IT DOES MATTER! 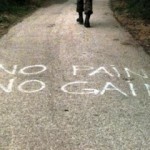 Whats the point of gaining mass if it comes at the cost of your health. Follow the BODY BEAST nutrition plan that promotes clean, whole foods in a wide variety and you are going to reach you mass gain goals! The motto of BODY BEAST is “Do Whatever It Takes”…But do it right! I hope this post has been informative and if you got some value from it, be sure you bookmark this page and share it on facebook – That way other people looking into BODY BEAST can get started on the right path! PS: What are your goals for BODY BEAST? How much weight are you looking to gain? How “big” do you want to get? Our team would be happy to hear what you have planned! @JasonJones8 however many meals you ARE capable of eating per day, you're going to want to meet your calorie/macro intake with those meals. Its okay to not eat every 2-3 hours but you DO need to meet your calorie intake and macros each day. Whats your main goal bud? I need help with a eating plan I have just finished my 90 days of beast body but I could not get with a eating plan that I could stick to. I did however change as far as my size and definitions but I need help getting the abs and the ripped physique that I see in pictures. I calculated that I was at about 3600 calories a day and never came close to that at all and I don't know what to eat. I want to start a new 90 day plan soon and would like to have some advice on how to get started with the foods on the list and how to put them tofu to make it work for me. Thanks a lot. @dinman1979 if you want the six pack abs...I dont recommend following the body beast meal plan. I would recommend the p90x meal plan. Have you seen "my 1900 calorie diet"? 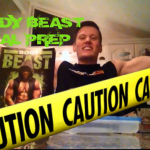 @dinman1979 You outright admit you couldn't follow the plan for body beast. What was your final target supposed to be and what did you achieve for intake during the "beast" phase? What if you are in the 1800 calories. Do you still keep it at 25/50/25 and what would be the recommended portions of each? Hi I ordered the Beast workout. I am trying to build more muscle and trying to get a six pack. I need to burn a lot of fat off me. When I have a shake will that put more fat on me. I workout everyday I have some muscle but not enough. How do I use the shakes I have fuel shot and base shake. Could you please help me with this. my intake for calories are at 1500 or less but still have all that fat. I'm very worried about gaining weight on this program. I want to lose 15 pounds and build muscle. What is the better program for doing that? @kct ya, the 50% carbs is definitely NOT for cutting fat. What is your calorie intake at right now? 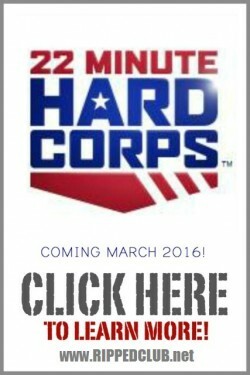 @coachtodd I am having some trouble understanding the change in the timing during phase three. What exactly does that mean? Also any suggestions? @fachondo Hello, I don´t understand how to get breakfast, lunch, dinner , etc. from portion charts and food lists. @fachondo first you go to the portion chart and find your calorie intake. That will tell you how many servings of eat food group you need each day. Then you go to the food list which has your serving sizes and determine what foods you want to eat from that list. @norminator you dont NEED the body beast supplements man...If you can get some decent whey protein and decent creatine supplements...you are good to go! The biggest gains will come from being at a calorie surplus and eating CLEAN FOOD for fuel! I found this site and is very excited. I've been back and forth about buying BB and finally did today. I need too loose some fat especially in my lower body. I do not like cardio and always preferred weights. I was afraid that BB may cause "bulky" legs though, but reading through the posts I understand that you recommend a 50/30/20. My goal is to lean out some instead of bulk. I am a female. 35. 5.10 ft at 200 lbs (pear shaped). If this combination is indeed what you will advice, how long to I maintain it? Thank you for all the great advice. 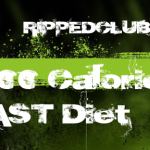 @Bleu0806 I would maintain your calorie intake and 50/30/20 ratio until you start to see your fat loss plateau. First, try to increase your calorie intake by a few hundred calories to see if that ignites your fatloss again. For men I recommend switching to 40/40/20 once they reach 10% body fat. For females, that might be somewhere around 20-25%. 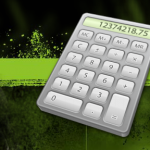 Does the Body Beast program tell you how many grams of protein you need? That is easier for me to keep track of than aiming for a certain number of "portions" of protein. I'm 6'2" 220 lbs and am currently doing Les Mills BodyPump. I'm very interested in Body Beast but am considering getting down to 200 lbs before starting the 25/50/25 split since I'm likely to reverse my weight loss a bit. I'm currently eating 33/33/33. Does that plan of attack make sense? Would the P90X Fat Shredder be the same as Beast Phase 3 nutrition plan? Thanks for the nutritional info. Starting on Sunday. Looking to recomp more than anything. I've done the X a couple of times, but love lifting heavy. Can't wait to get started! Hi Todd, I'm interested in Body Beast, but I don't really want to look like some of the gross body builders that are out there. Would I have to maintain this workout to keep the mass? I'd like to stop at a certain point. For someone my age 26 is a test boost really that important for gaining mass?? I did body beast and i am going into phase 3 and i really did not gain as much mass as i wanted but i did gain almost then pounds. Also I feel like its un natural to take a test boost/ it can not be healthy for someone my age or benefit my health in the long run. Could i be mistaken??? Checking out the writeup of the nutrition. Pretty bad advice on the percentages. Too many carbs will make you fat. People can eat all the crap when they do steroids. Sagi does steroids. Don't worry about question two. I just watched your "How to calculate P90X nutrition". Hey Todd, I'm 6'1, 18 years old, I weight 126 and my BMI is 16.6. I walk about 5 miles to work 4 days a week and play Soccer regularly I've always been a fussy eater but I am looking to change that. I have been looking into buying P90X, Insanity and Body Beast but I don't know which one will benefit me the most do you think in your opinion? Much Appreciated. HI Todd, Im 6ft, BMI of 24.5%, would like to try the BB Lean, would I be able to use this programe? Cheers!! Awesome Post. Looks like someone did their homework. Starting the Beast on monday! Can't wait!